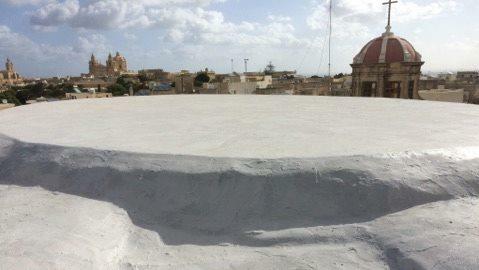 A temporary roof has been put in place to replace the section which caved in over the altar of Ta’ Ġieżu Church three weeks ago. The Franciscan Fathers hope to eventually replace it by a dome. Bank of Valletta CEO Mario Mallia paid a visit to the church to present the bank’s donation towards the repair work . AX Holdings, a private company specialising in construction, development, hospitality and healthcare, has also donated financial support. Franciscan Provincial Richard Grech has warned that much more is needed, citing €300,000 as being required for the dome alone. Donations may be made by depositing funds into BOV account with IBAN MT43VALL22013000000040020868884 at any BOV Branch, or through BOV Internet Banking.